I absolutely love my dog and love all dogs--their loyalty, love, and intelligence. I even wrote a post about why my dog is sometimes preferred over humans at times! And of course, I've heard and seen examples of dogs who help people with disabilities and make the work of the military and police much easier because they aren't afraid to go in and take down the bad guys! Last week during the Thanksgiving Break I decided to watch a few T.V. shows that had been recorded awhile back but hadn't been watched yet. One of the shows that had actually been recorded by my husband, but grabbed my attention was HBO's War Dog: A Soldier's Best Friend. It premiered on Veteran's Day, but has been streaming on HBO daily. It was produced by Channing Tatum, among others.They did a great job, I must say! I wasn't prepared for the range of emotions that hit me with stories of 3 different war veterans, all heroes, and their canine companions. One story is about a dog who took a bullet before it hit his soldier, one is about a soldier who took a bullet rather than let his dog unnecessarily get into the frey, and one is about a dog who made the ultimate sacrifice for his "family" of soldiers. 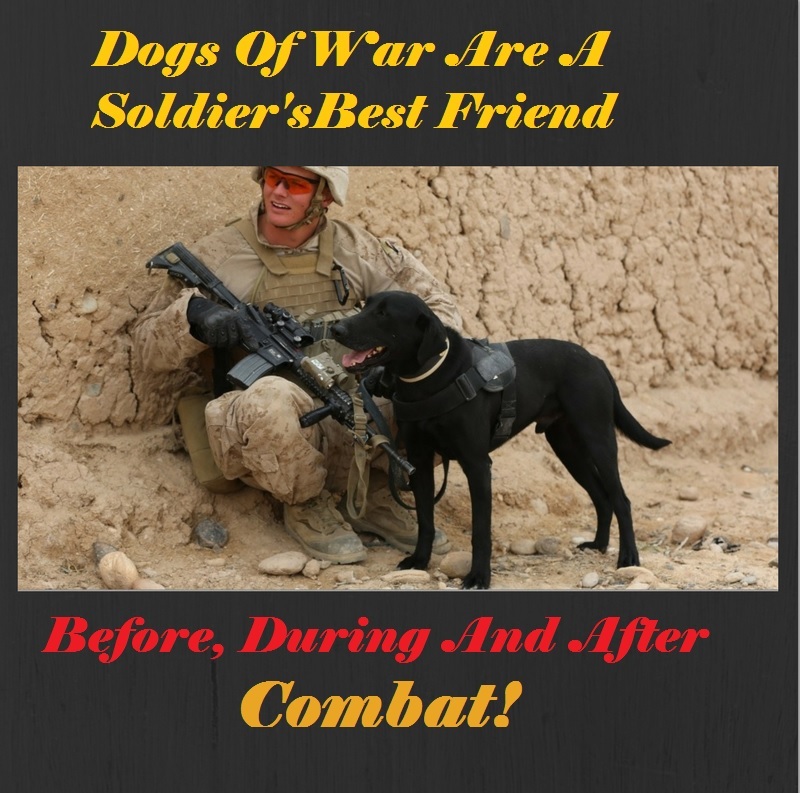 It was very apparent that these dogs meant everything to these soldiers and they became like family to them, going through the traumatic circumstances of war with them. The dogs didn't wait at home, hoping that their masters would return. No, they experienced actual combat situations with them and were trained beforehand to help them carry out their difficult missions. The portrayal of the bond between these veterans and their dogs is masterfully done. It is unequivocal that once a dog and his soldier go through the things they do together, that they are bonded for life. Think about it. These soldiers do things that normal people can't even fathom doing. And it starts during their training. It's so intense, with their dogs going right along with them. When all is said and done, these soldiers need some help when they come back to civilian life. They are that much better off if they have their canine companions there with them to show them how to get back to normalcy. Many soldiers get to be reunited with their dogs, but some don't. And that was brought into bright focus in this documentary. I was appalled at the heartlessness of the DeSoto County Sheriff's Department in Mississippi, who had acquired Sergeant Dixon's dog, Mika, after he was injured and put in the hospital. After his release from service, he found out through much research where his dog was. It was his understanding that once she was retired with the Sheriff's Department, he could have her back. But they wouldn't give him permission to be reunited with her, much less see her or have contact with her. The best that they could offer him was a picture. This was a family man, who had children and a wife that needed him. I could literally see the pain and desolation in his eyes as he told his story, and his wife definitely experienced his haunting flashbacks during his sleep. He never gave up hope, though, that somehow he might be able to see his dog, to at least see that she was OK. Without saying much more about the story, let me just say here that although our veterans aren't given the honor that they deserve in terms of benefits, healthcare, and pension, they should at least be given the dogs that they went to battle with. With no exceptions. If somehow they are separated because of technicalities, there should be special provision in place to make sure that if the soldier wants that canine back, there should be no questions asked. It's not too much to ask of anyone or any agency. If you are a dog lover, or even if you aren't, this documentary will definitely give you something to think about! You can follow 'Military Working Dogs' on Facebook to learn more about the special relationship between handler and canine.